Most new cars and light-duty trucks come with a Tire Pressure Monitoring System as standard equipment. Many higher end motorized RV have such a system as standard equipment or as an option. There are standalone systems that can be purchased to give real time tire pressure readings and certainly these are highly recommended. For years, tire manufacturers have recommended that drivers regularly check their tire pressures, however in this ever busy world, we know that most don’t take the time to check. Do you? 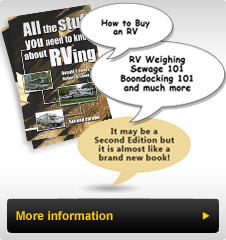 When a RV sits at a campground for weeks at a time, it is rare that the tires are checked before moving it. I can go on; you know what I am referring to. If you could simply walk around your car, truck, RV, trailer or motorcycle and instantly check the tire pressures, would you be interested in such a system? Look at Quick Pressure’s Tire Pressure Monitoring Caps (TPMC) and see how easy it is to carry out this important safety check. These US made, quality caps replace the valve caps on your tires. You buy the ones that match the tire pressures recommended for your vehicle. In some cases, especially on larger RV’s, this pressure may be determined by weighing the RV as it is loaded and ready to travel and the pressure required may be less than the maximum pressure that the tires is rated for. On most vehicles, the placard on the driver’s door post or the left front lower section of a trailer provides the pressure required. Once the TPMC is installed, you need only walk around the vehicle looking at the top end of the cap to see whether the tire is properly inflated (Green showing),10% low on air (Green with Red showing) or if more that 25% below the rated pressure, the TPMC will show Red. This is, by far, the simplest non-electronic method of checking tire pressure. We’ve been using these TPMC, for six months as of this writing, on a couple of vehicles that did not come equipped with a tire pressure monitoring system. On one, after having a shop install snow tires, the TPMC pointed out a slow leak which was not immediately visible by simply looking at the tire. This safety benefit requires an investment of $5.00 to $8.00 US ($7 to $11 CDN) per tire. Think about that: For less than a tank of fuel you have a safety system that alerts you to unsafe conditions. For more information, go to our website’s Product Tab, click on Horst Probes and Accessories and scroll down to Tire Pressure Monitors. Place an order and enjoy the safety of tire pressures that are being continually monitored.